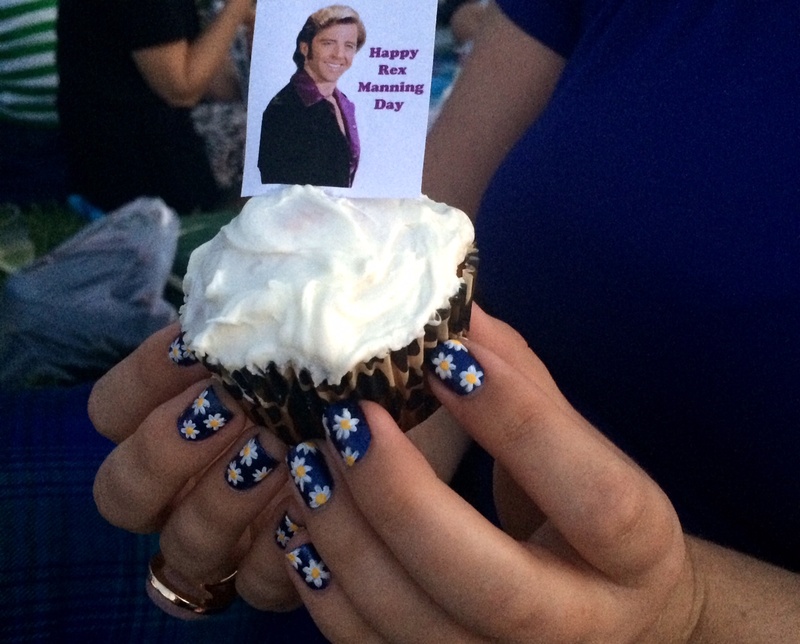 This weekend I went to the Cinespia screening of Empire Records, so obvs I had to do ’90s-themed nails! 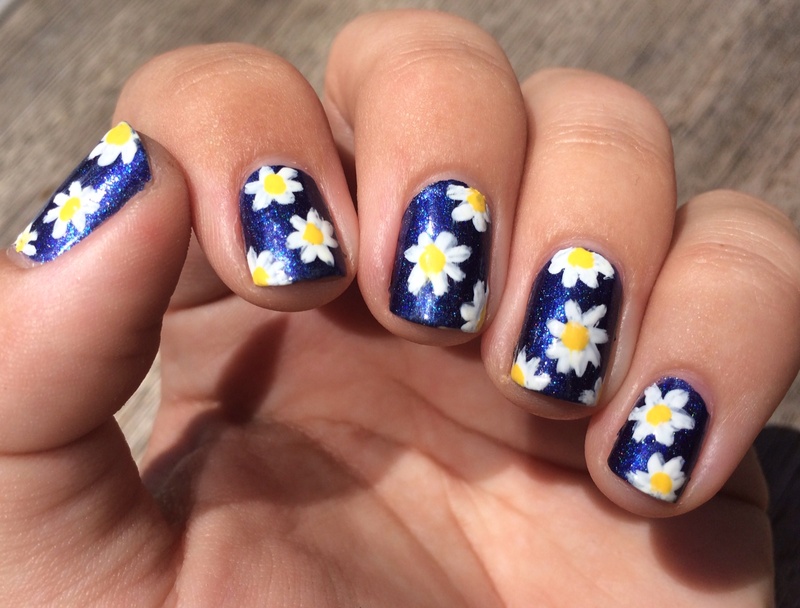 I wanted to do something with daisies to mimic the daisy print that was everywhere in the early 90s, and I think my final result was actually pretty great! I really wanted to use the fabulous indigo holo from my recent ILNP order, Indie Go. Previously I’ve only used ILNP’s glitters (which she doesn’t make anymore, sob) so this was my first time trying out a holo, and it was, as expected, fabulous. 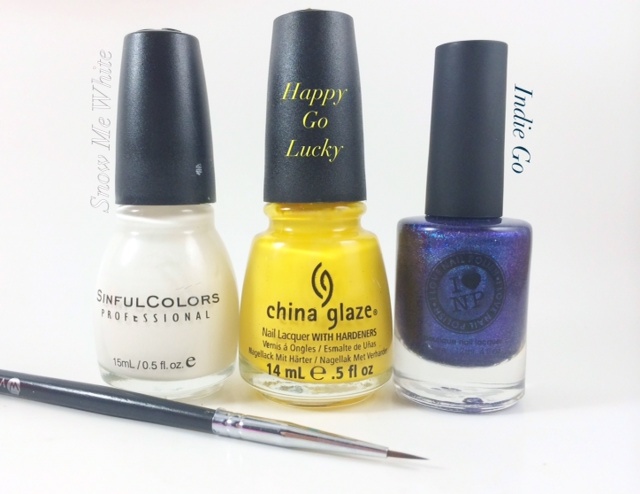 Indie Go was almost opaque in one coat, and the formula flowed easily onto the nail. It’s still sparkly under indoor lighting but of course comes alive in a holo blaze of glory when you’re in direct sunlight. It’s not a super linear holo, but very pretty nonetheless! It was really hard for me to capture the holo though, for some reason. After two coats of Indie Go had dried, I used a teeny tiny brush from my Winstonia set dipped in Snow Me White to paint little stripes in flower shapes scattered around my nails. 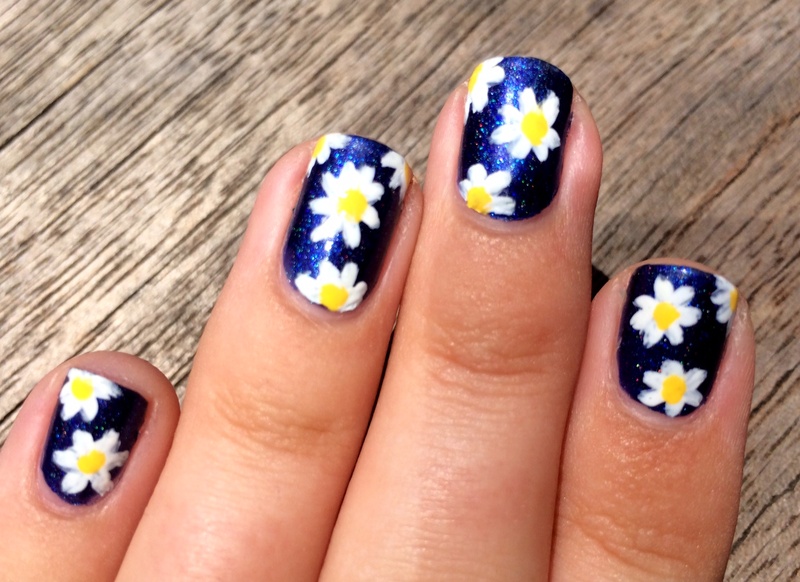 I finished the daisies by putting a yellow center on each flower with a dotting tool. I actually love how these came out! I was afraid they were going to look cheesy or messy but this actually turned out super cute and fun! Not bad for my first time trying floral nails, eh? I’ve talked before about the cemetery screenings, which is my favorite LA summer event, and this time I saw Empire Records. Admittedly, it’s not a great movie, but it is a fun one, and a nostalgic one if you grew up seeing it on TV a lot in the late ’90s like I did. We were a little disappointed at first because usually they have an actor, writer, or director from the movie they’re about to show talk a little before the movie starts, and they didn’t this time. 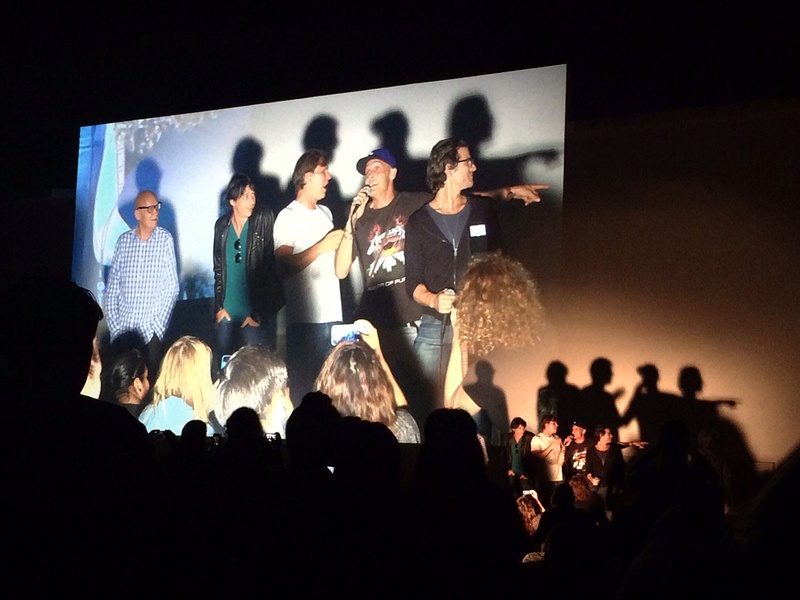 HOW-EV-ER, after the movie, who showed up but the director, DP, Ethan Embry (Mark), Johnny Whitworth (AJ), Coyote Shivers (Berko), James Willis (Eddie), and Brendan Saxton (Warren)? 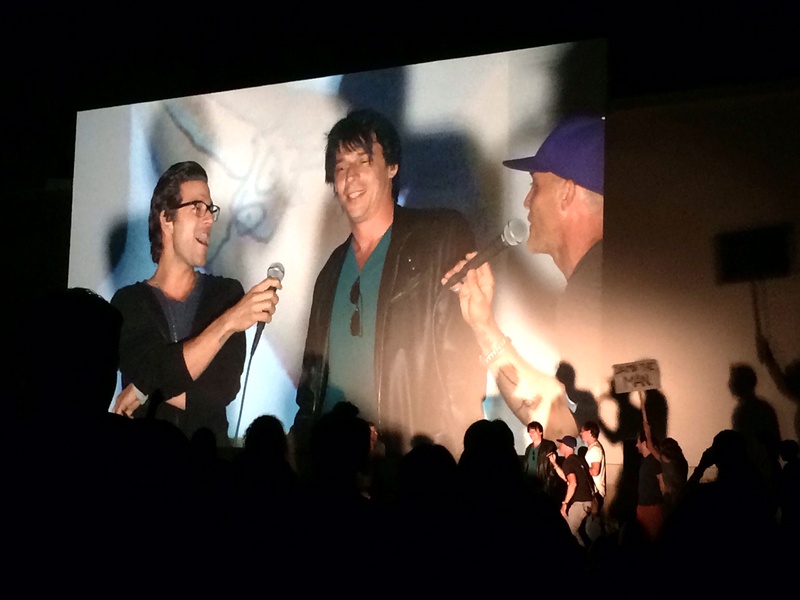 Apparently the director got kicked off the set of the movie and it never officially got a premiere, so the cast and director were all super excited to be at the screening to see all the fans. They tried to do a Q&A but there wasn’t a mic for the audience, but a few people did run up and ask a question, including one girl who asked what everyone’s favorite song from the movie was. Everyone said the Gin Blossoms song (obvs) except for AJ, whose fav was the Romeo & Juliet Dire Straits song. (AJ, by the way, is still super hot – maybe even hotter than he was in the movie.) The absolute best, though, is that someone asked that Berko sing “Sugar High,” which he didn’t seem to want to do but then the DJ started playing it, and he sang the whole song! I haven’t had any time for detailed nail art lately, so I quickly threw on this simple, bright skittle a few days ago that I actually ended up loving. In person Lava Lamp is a true orange, but the other bottles didn’t look as bright as they are in real life, so I had to tweak the photo to fix those, and poor LL came out super red. 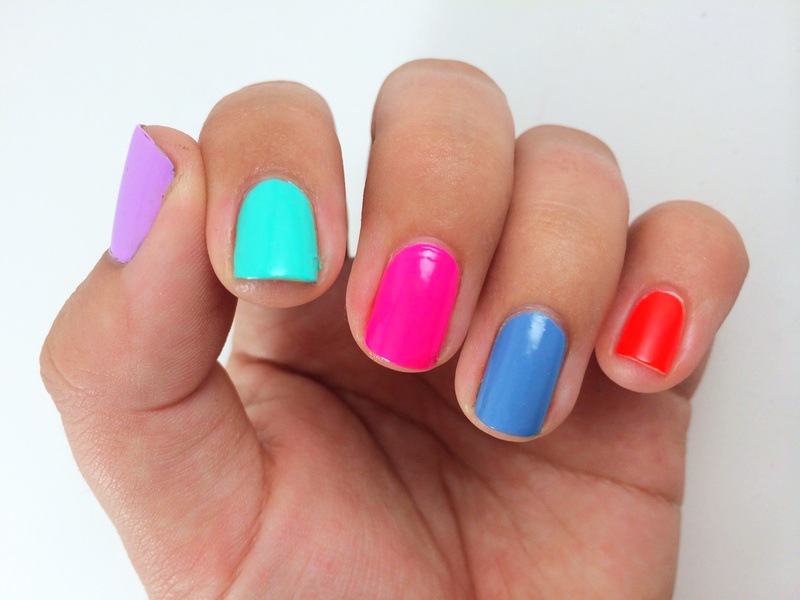 I’ve used all of polishes before on this blog, and it’s because I love them all so much! Every time I use Lime Crime’s Lavendairy, I think I should scoop up the other LC polishes because the formula is so great – this guy was almost opaque in one buttery coat! I can’t seem to stop using Too Yacht To Handle, despite its sometimes-fincky formula (it can be streaky and need three coats if you’re not careful), and I noticed that next to the bluish-purple periwinkle of Electric Beat, it looked positively green even though it’s a bright aqua. Electric Beat, by the way, is another great almost one-coater and the kind of color I never used to like until about a year ago but now I love this medium periwinkle hue – it’s not too demure but also not too bright/in your face. Wonky handddddd. I tried to find a pose that would get my thumb in without doing a claw. Also, please forgive my tip wear! I’m really into greens lately and couldn’t resist using a few of them together, resulting in this green explosionnnnnn. I painted The Real Teal (which looks super blue next to the mint) and HOMS on a wrung-out makeup wedge and sort of rolled it on my nails, then dabbed a bit up and down to make sure the middle looked like a smooth gradation. After that dried, I carefully applied one coat of Emerald Dew Drops (EDD). I’ve extolled the virtues of ILNP’s glitters before, but ughhhh they’re so good, y’all! I think Barbra, sold off the remaining glitter polishes during her last sale (when I scooped up EDD plus three holos) and I understand that she’s found her niche as a holo/multichrome creator now, but I do hope that she eventually makes glitter again. I just love her combinations, they’re so unique and lovely! EDD is comprised of solid and translucent white hexes and bars, teal squares and shards, smaller green hexes, and holo micro glitter. I love itttttt – even with the bar glitter, which is not usually my jam – and think it’ll look fab over an array of colors. The formula is fantastic for a glitter, it’s not hard to move pieces around on the nail and you get a good amount of glitter with each swipe. I used two coats of NYC’s In A New York Minute to smooth it out because my Seche is all dried up, but EDD isn’t too bumpy so it feels fine. Saint George is truly gorge, and one of the first indie/more pricey polishes I bought way back when I first started to really collect nail polish. 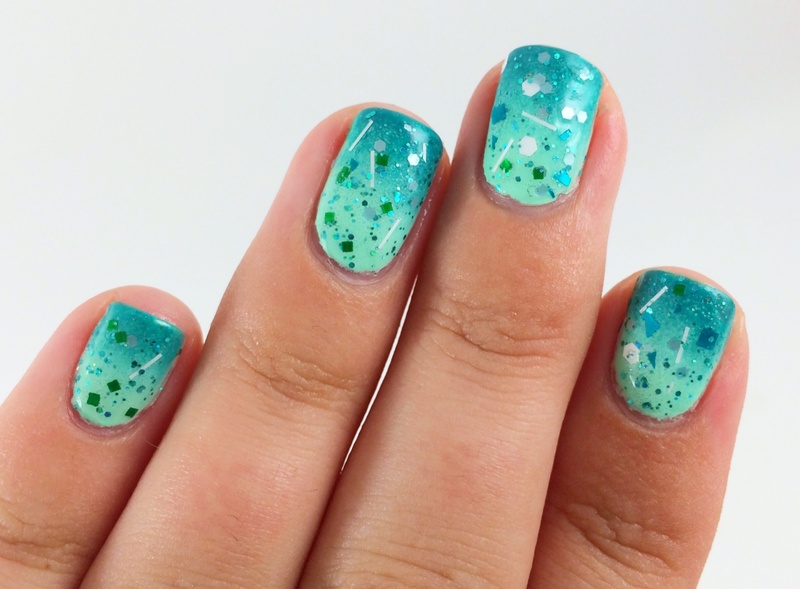 It’s one every polish lover needs in their arsenal – it’s a one coater, has that lovely a-England trademark scattered holo, and is the most fantastic deep teal. Ughhhh I love this color so much! I’m glad I chose Saint George to pair with this neon pink than the mint I was originally going to use, it looks so much richer. The Pink One is another indie from abroad! I got TPO and Daphne’s Birthday party, a fun glitter topper, sometime last year, I think, after I saw TPO on Stuff I Swatched. If you’ve been reading my blog for any amount of time you’ll know I’m not generally a pink person, but this one is special – not only is this fabulous neon pink opaque in two coats (!) but the branding for Pretty Serious is just awesome. I’m a sucker for packaging – it doesn’t always make me buy a product, but I definitely take notice when a brand puts the time in to create something that’s fun and completely reflects their brand, and Pretty Serious did an amazing job. I love Daphne, their mascot there on the side of the box. Their illustrator is so great! 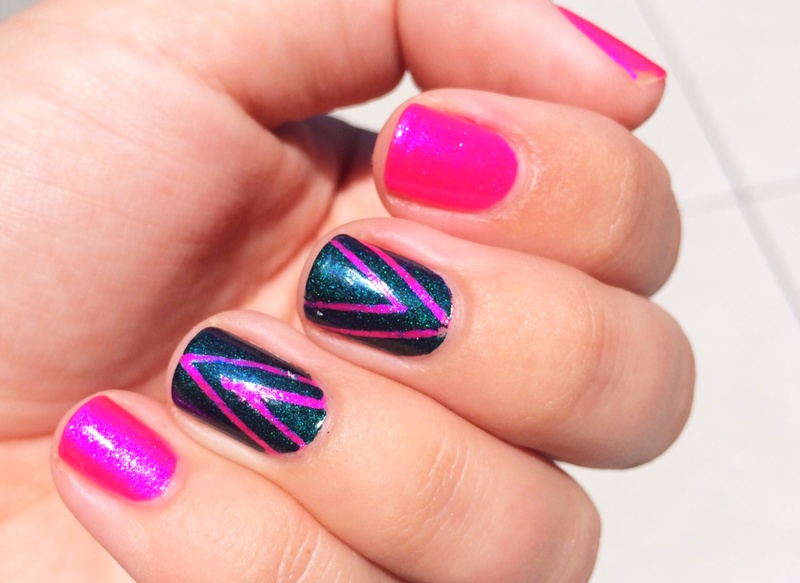 I did the design on my middle two fingers with striping tape and UGH. 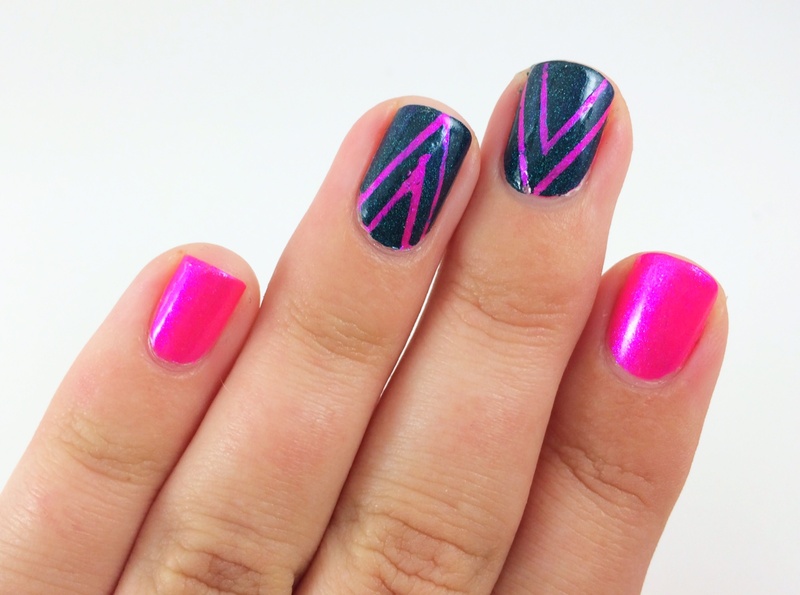 Sometimes striping tape is just such a struggle for me! You can see the actual design turned out pretty well on my middle finger, but wouldn’t adhere securely enough to prevent some of Saint George seeping under the tape. Then over on my ring I lost the end of the tape so I had to sort of cut into it again to make another one, and that makes a thicker piece, and it wouldn’t lay as nice as the pieces on my middle finger and blerggggg. I haaaaate when things can’t be perfectly uniform (unless that’s the look I’m going for, obvs)! I like this design, though – simple and not too time-consuming, tape issues notwithstanding. I think I need to rig up something like this with my striping tape, but that would mean rounding up all the random spools scattered around my apartment…. Here’s the one photo I captured outside before clouds rolled in – you can see how sparkly Saint George’s tiny holo particles are and that gorgeous shimmer in TPO! 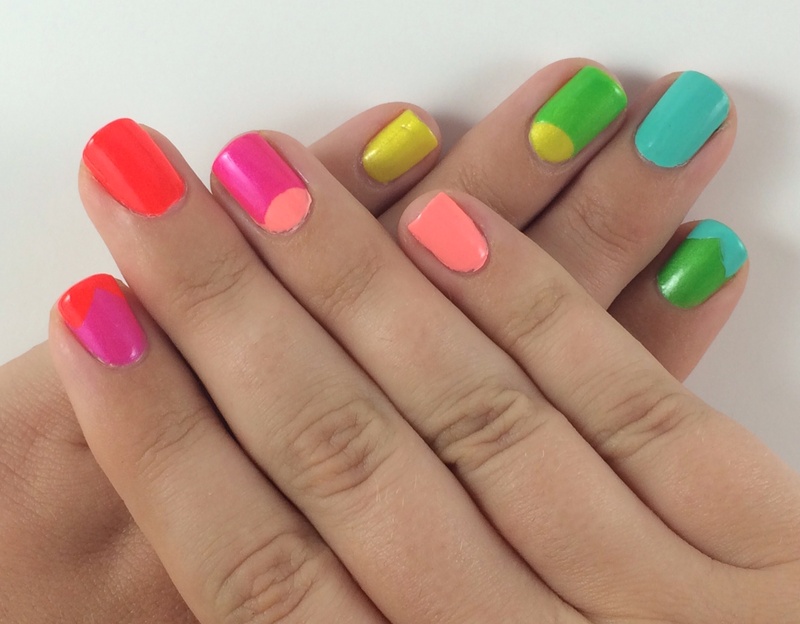 I was craving something bright and easy, so I grabbed these polishes kinda at random and ended up with this fun mani. 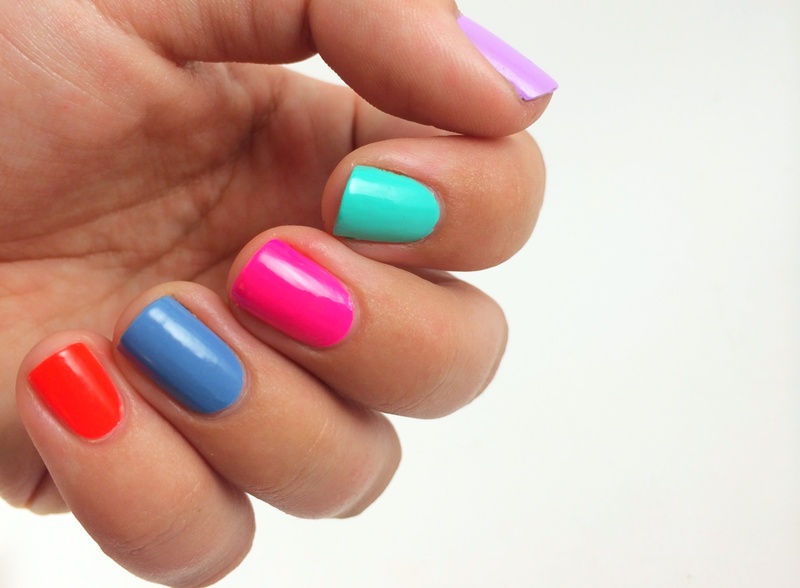 I love it so much – the bright colors kept catching my eye and making me so happy all day at work! I’ve featured Too Yacht To Handle and East Austin on my blog before, but the rest are old favs that are making their debut. 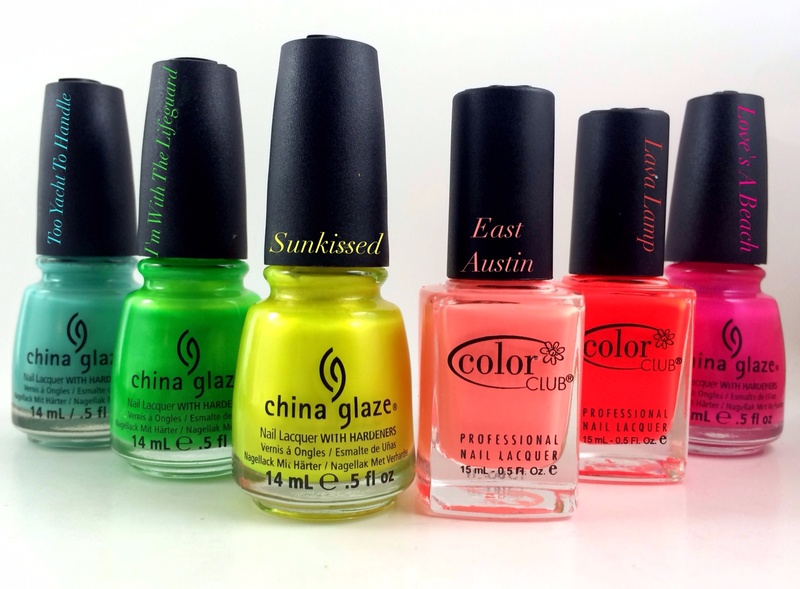 Three are from one of my favorite nail polish collections of all time, China Glaze’s 2012 neons – Sunkissed, which isn’t quite an eye-searing neon yellow, but it’s still super bright; I’m With The Lifeguard, which is just neon green perfection; and Love’s A Beach, a fun warm-leaning Barbie pink. 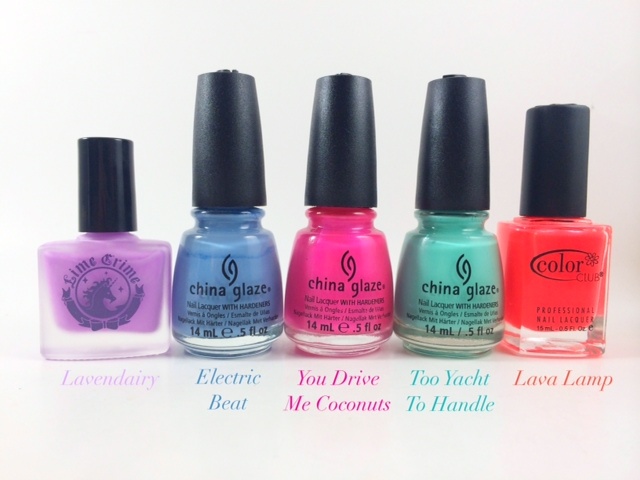 They all required three coats, but just barely – in fact, I think Love’s A Beach might’ve been okay at two, but with the crappy lighting in my apartment, I didn’t want to risk it. The retina-burning orange is Lava Lamp and I’ve only used it once or twice but I should really step it up because day-um that color is truly amazeballs! it’s like traffic cone orange on crack and even better, it’s only a two-coater. Ack, sorry for the ding on my pinkie! And the tip wear, I’ve had this mani on for a few days now. I almost left this as is when I did my base coats but decided to throw a little variety in there so I did half-moons on my ring fingers with hole reinforcement stickers and freehanded angled tips on my pointers. It’s not perfect – I didn’t get the tips angled correctly or 100% evenly, and the moon on my left hand is a little off – but the colors just make me so happy! 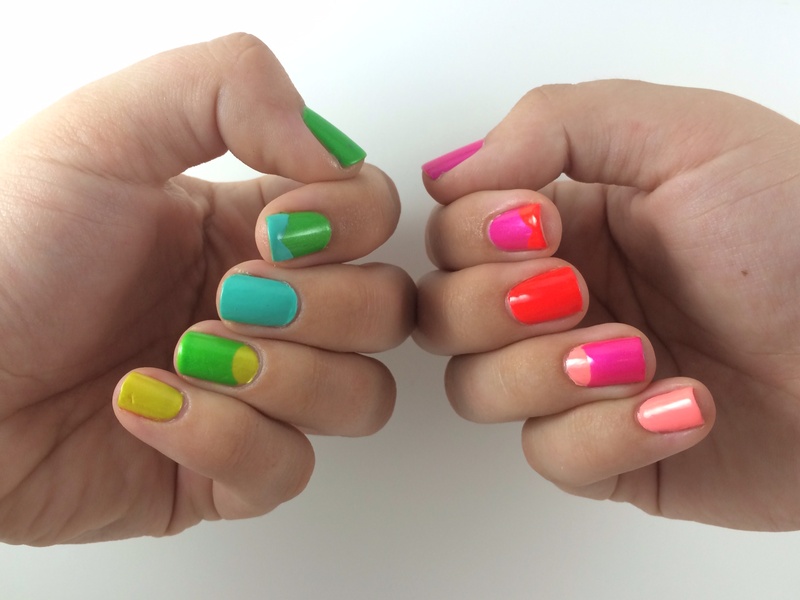 Seeing all these bright colors makes me want to do a neon ombre now, hmmmmm. Also, I realize my hands look dead here, but when I tried to tweak the photo, Lava Lamp came out red instead of the glorious, vivid orange that it really is.